We Cross the Apennines | Sprezzatura, Y'all! It’s a beautiful Sunday and we decided to take a day trip to the Adriatic Coast and have lunch. It’s less than 100 miles but it takes a good two hours. That’s because you have to drive over the Apennines to get there. The Apennines run pretty much the entire length of Italy. If you think of Italy as the boot, the Apennines would be the zipper. This country is small, about the size of the state of Arizona. You look at a map and think you’re close to something, but you almost always have to factor in a mountain range, or at least significant hills. We were prepared for the long drive to the coast. We’ve crossed those mountains before on previous trips so we knew what to expect. Gorgeous scenery, hairpin turns, going up and going down, bumpy roads, and few guardrails. This trip didn’t disappoint. What was different about this drive was the incredible number of motorcycles on the road. I guess Sunday afternoon is the time to take your bike out and see how fast you can go and how many cars you can pass as you cross the Apennines. We had lunch at the only restaurant we could find that was open. It was packed, probably because it was the only restaurant that was open. Fascinating place. Huge groups of people having Sunday lunch. When I say huge, I mean groups of 20 or more. Platters and platters of food. We were there about an hour and a half and all the big groups were there when we got there and were still there when we left. They might still be there. Sunday lunch is a long, leisurely affair with lots of food. And motorcycle races, evidently. We got an education in the Italian love of motorcycle grand prix races. Who knew? It was on the several TV’s around the room and all the men were glued to it. They all cheered when certain things happened (we weren’t quite sure what) and the women politely clapped. Some men who weren’t seated where they could see a TV gathered around one at the front door. Motorcycles on the mountains, motorcycles races in the restaurant. 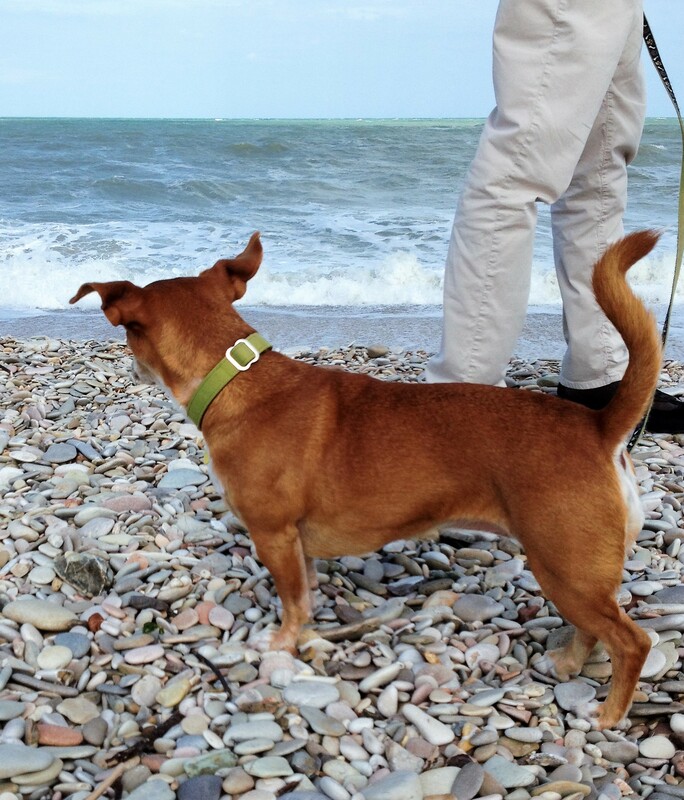 We strolled down the pebbly beach a little bit after lunch and Millie the dog saw her first ocean. She was skeptical. Lots of interesting smells, but too many loud noises. The waves were pretty big and when they came to the shore they crashed and sprayed with much gusto. The views on this drive are really unbelievable. And very difficult to photograph. The road is tiny and windy and there are not many opportunities to safely pull over and take photos. You’ll have to take my word for it. The landscape goes from Northern California rolling green hills to rugged, craggy Utah mountains. Around every turn, there’s a wow moment. Truly wonderful. The weather takes several turns as well. On either side of the Apennines, it’s beautiful and sunny. But over them it’s almost always cloudy. It’s like the clouds get stuck on the sharp peaks and can’t move. We love that it’s a reasonable way to spend a day. Going from the middle of the country to the coast in a couple of hours and getting some incredible scenery along the way. Maybe next time we’ll go to the Mediterranean coast and see what’s going on over there.